WOW! This is an extraordinary reading experience! 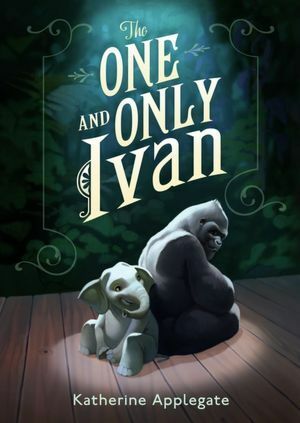 Ivan (the One and Only) is a gorilla who narrates his own story in the strong, yet gentle manner which characterizes both his personality and his outlook on life, friendship and art. Ivan lives at the Exit 8 Big Top Mall and Video Arcade with his friends Stella the Elephant and Bob the Dog. Born in the African Congo, Ivan and his twin sister were captured by the poachers who killed their parents. Brought to the United States in a crate (his sister died during the trip) Ivan is purchased by Mack, the owner of the Big Top Mall. Mack and his wife Helen raise Ivan as they would a human baby: he wears clothes, lives in their house as a human child and eats what they eat. Predictably since he IS a gorilla, Ivan grows too big for a human household. It is at that point that Ivan is moved into his “domain.” (Ivan doesn’t like the word “cage.”) Ivan is one of the star attractions at the Big Top Mall along with Stella’s three shows a day, 365 days a year. At the beginning of the story Ivan has not left his domain for 9,876 days. He’s counted. A true artist in his heart, Ivan has always created paintings with mud as long as he can remember. Julia, the janitor’s young daughter, is also an artist and likes to sit near Ivan’s domain to draw. She recognizes Ivan’s talent and his gift for seeing things in a different way. She often slips him art supplies to feed his drawing passion. Mack sells Ivan’s drawings for $20 each in the Gift Shop ($25 with a frame). When the Big Top Mall business slows down Mack brings Ruby, a baby elephant, into their little menagerie, figuring a baby elephant will attract more visitors. Ruby, recently taken from her family in the wild, bonds quickly with Stella. As a former circus elephant, Stella bears the scars of the cruel torturous “training” she received throughout her life. Now near the end of her own life, Stella wants something better for Ruby. In his fondness for the sweet and curious baby elephant and his love for Stella, Ivan promises his friend that he will save Ruby from the three-show-a-day-365-days-a-year existence. When Ivan makes his promise it is out of love for his friend. After he has made it however, he realizes that he has no idea how to accomplish it. Ivan’s stalwart determination to keep his promise and the brilliant way in which his artistic sensibilities and the strength of his friendships combine to create a moving climax to the story resonate with all that is GOOD in a world where that is sometimes hard to find. The bonus is that Ivan is a REAL gorilla. He was enclosed in a tiny living space on display in a Strip Mall much like the one in the story, alone for almost 30 years. He now lives in a zoo in Atlanta. I never thought I would love a book narrated by a gorilla and I LOVE this book! It is a fantastic read-aloud for 3rd through 6th Grade and defintely could apply outside of those guidelines depending on the maturity and dynamics of a particular reader or group/classroom. Do yourself a favor and treat yourself to The One and Only Ivan by Katherine Applegate.